This past weekend’s 5th Annual Jersey Shore Wine Festival, presented by the Lakewood BlueClaws at FirstEnergy Stadium, broke records as the largest festival yet drawing nearly 3,000 festivalgoers through its gates over two days. The successful event drew friends and families from all over the Garden State who came to sample from nine of the state’s finest wineries, which included award-winning wineries such as Valenzano Winery, DiMatteo Winery, Monroeville Vineyards & Winery, Plagido’s Winery, Tomasello Winery, Four Sisters, CAVA Winery, Wagonhouse Winery and Sharrott Winery. The wine festival also featured over 40 unique crafters and retail vendors, food trucks such as Star of the Sea and Dark Side of the Moo, which offered delicious Kangaroo Burgers and Alligator Sausage Sandwiches, and live performances from funk-reggae surf-rock band Funk Shway and Jersey Shore favorite Astronaut Jones, while festivalgoers set up beach chairs and towels on the lush lawn to enjoy the sunny weather and music. One of the happiest festivalgoers is sure to be Mona Tobia, of Howell, an Assistant Principal from Matawan-Aberdeen’s Lloyd Road Elementary School, who came racing up to the register-to-win table near the closing of the festival on Sunday afternoon, asking if she was too late to put her name in the drawing for a gorgeous wine basket. As it turned out, Tobia ended up winning the register-to-win raffle for the wine basket a couple hours later. The lesson is: You’re never too late to go to the Jersey Shore Wine Festival. All net proceeds from the wine festival are donated to Sylvia’s Children, a Holmdel-based 501(c)3 organization working over the past 12 years to improve the living conditions for more than 1,000 children in the village of Mbiriizi in Uganda, Africa. 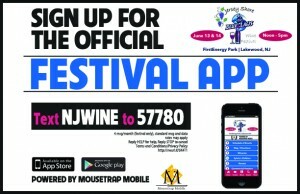 Sponsors of this year’s Jersey Shore Wine Festival included the Asbury Park Press (a Gannett paper), TD Bank, New Jersey Monthly, WJRZ 100.1 FM Jersey’s Greatest Hits, The Lakewood BlueClaws, and Allen Consulting. For more information, contact Sylvia Allen, sylvia@allenconsulting.com or 732 946 2711.